One of the most challenging components to shop for when you are a skateboarder are skateboard wheels. Wondering why that is? The truth is that there are thousands of different wheels out there with various colors and flashy designs. You also have to decide on what size of wheel is the right one for your riding style. On top of that, you have to consider the strength of the wheel, how fast it will be, and how much balance and control it offers you. A beginner is going to want a different set of wheels than a professional and someone who wants high speed might want a different wheel than those who like to pull tricks all day long. We’ll get into the nuts and bolts of all these things later in this article, but for now, let’s just look at the basics of wheel size. The diameter of your wheel can range from around 50 to 75 mm, with the lower numbers corresponding to smaller wheels. Small wheels are the slowest while large wheels are the most lightning fast. That said, most technical and street skating is best with a small wheel that is close to the ground. Wheels that are 50 to 53 mm offer a slower ride. They are also known for providing more stability for riding in parks, bowls, and on the street. Medium sized wheels are from 54 to 59 mm in size and are versatile. They can be used by beginners and work well for larger skaters who enjoy street, park, vert, or bowl riding. The largest wheels are 60 mm or more and tend to be used for old-school boards, longboards, and downhill boards. These have the most speed and do well on rough surfaces. Our first choice for wheels is this set from Ricta. They are white with a sky-blue logo and come in many different sizes to fit your skating needs. The surface of each wheel is smooth, which means there is a shiny coating on top. This kind of surface is excellent for anyone who wants extra traction and grip out on the street or pool. The shape of the wheel is traditional and exactly what you would expect from any skateboard wheel. It’s not particularly narrow or wide, so it will work in many different situations. This makes it a wheel set that would be a great choice for a beginner to skateboarding. Ricta Wheels is a well-known company which is known for their “speed reinvented” technology. Each wheel is made with a special urethane formula to ensure the best speed possible from non-cored wheels. They are also known for offering wheels that are resistant to flat spots, so you don’t have to worry about the wheels giving out after only a little use. The Spitfire Bighead comes in a large variety of colors from red to orange, yellow, blue, and more. Some of the sets even come with two of one color and two of another. 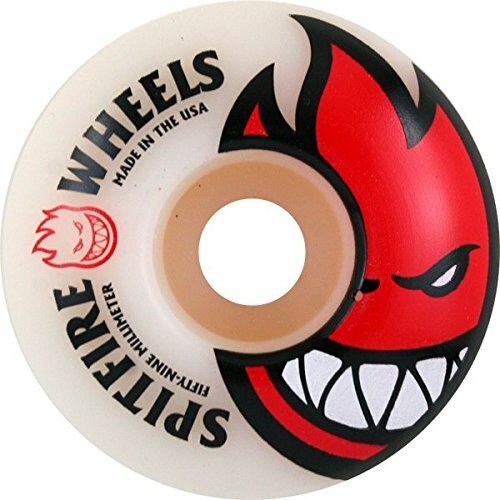 The wheels feature the Spitfire logo blown up across half of the wheel. These come in various sizes and have a durometer of 99a. This type of wheel is made for use in parks and pools when you need additional grip. The skateboarder who is no longer a beginner will find these are a fantastic option and they can even be used on street on occasion. The wheel profile is standard while the surface is threaded. This is part of what gives it the extra traction and grip. Spitfire Bighead makes all wheels out of high-performance urethane right in the United States. You can expect that the wheels will prevent flat spots and have the traction you need to do all the tricks you want in the skatepark. They’re also a reasonable price for the quality you get from them. Powell Peralta is a well-known skateboarding company that puts out some outstanding wheels. When these wheels were first being made, they were known as Rollerbones. 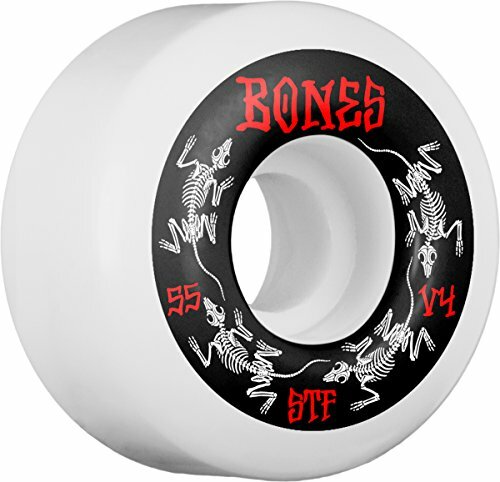 However, after Steve Caballero had a look at them and tried them, the name was switched to Rat Bones. These wheels come in various colors, but this particular option is black with understated white text. They are 60 mm and feature 90a durometer. That means they are best for somewhat experienced skaters, especially those who street skate most of the time. The set of wheels isn’t too pricy, especially for a Powell Peralta offering. They feature a smooth surface, a natural formula, and a Rat Bone wheel shape. Reviews from past buyers are largely excellent, so this is one wheel that you should have on your list when picking up a new set. 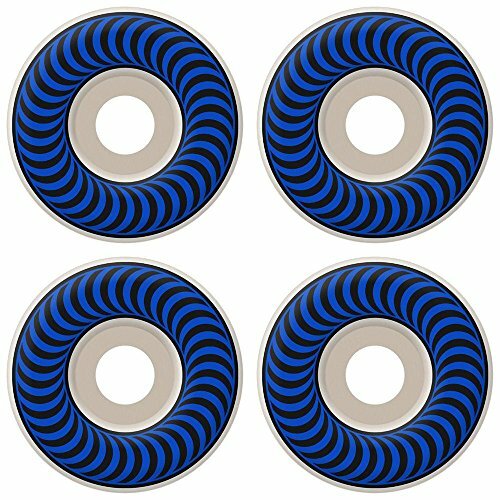 These Everland skateboard wheels are high-quality and come at an extremely low price point. 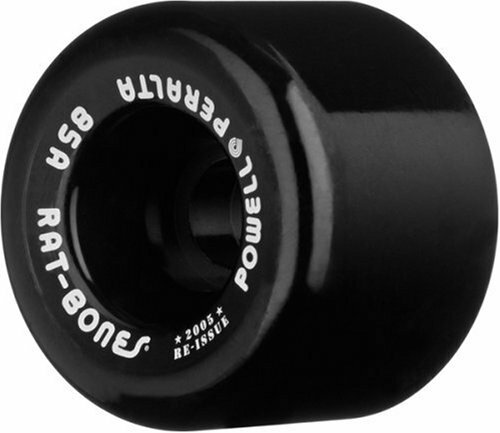 These wheels are a size of 65 x 51 mm and are made for cruiser style riding. They have a decent grip, great shock absorption, and are extremely reliable. You can also expect this wheel to be long-lasting and aesthetically pleasing. This particular option comes in red, but it has a clear quality to it that makes it stand out. If that isn’t your first choice for hue, there are nearly a dozen other colors to choose from. These are great for longboards and can handle flipping and cornering despite that. These are made of polyurethane, which offers strength and long life. The only thing that might be a negative is that because of the material, when you open the set for the first time, you may notice a chemical smell that can be off-putting. In addition to that, these are a great price for any skateboarder. The California Roll by Shark Wheel is an extremely unique skateboard wheel. When you take a look at them, you’ll notice exactly why. The shape is similar to a donut with a few bumps and hills. These are another option that is best for cruising and longboard use with a fantastic ratio of length to width. What that means for you is low friction, low center of gravity, and an outstanding grip due to the large footprint. These wheels come in a number of colors including black, white, blue, green, yellow, pink, and more. They have a diameter of 60 mm and a durometer of 78A. When out taking on the town with your skateboard, this set of wheels will make it seem like nothing when you roll over dirt, pebbles, or other debris. In addition, the strange design can actually push these things away from you as you roll. It makes for a solid set of wheels for someone who longboards. 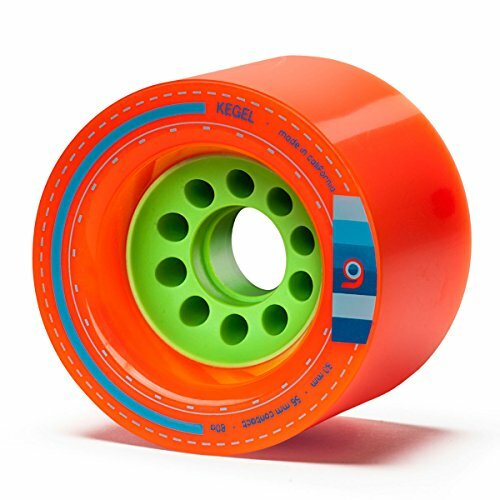 The Orangatang Kegel is another set of wheels made for longboards with an 80 mm diameter, 83A durometer, and a 56 mm contact patch. The surface of this wheel is smooth with a squared off lip profile. It comes in purple but there is a brother product that comes in orange which features a slightly smaller durometer rating. Due to the large size of either wheel, you know you’re going to get great speed and be able to pass over obstacles without trouble. These wheels are bit more expensive than some of the others we’re listing but they are extremely high-quality with an aesthetic that many will find charming. You’re going to get amazing traction and a grip that is more than sufficient for longboard and cruising skateboarding. The wheels have been used by several riders in the IDF and IGSA circuits who ranked high, so that goes to show the performance you can expect. We talked about the blue clouds by Ricta but now it’s time to look at the red clouds. These wheels feature a 53 mm size with an 86A durometer. This makes them excellent for skating over surfaces that would be nearly impossible to skate with typical wheels. However, they will still do the job in parks or on the street and have a reasonable amount of slide. They have a smooth surface and a standard skateboard wheel profile. What these wheels excel at is being fast and bouncy, which means that no matter where you skate, you can expect to feel smoothness like you were in a pool or on a vert ramp. The price on a set is average and won’t break the budget for most skaters out there. If you are a hybrid skater, this is one of the best options you can choose and offers extra versatility by being capable of sliding over almost anything in the road. The STF V4 wheels feature Bones’ street tech formula which incorporates the highest quality components to build a wheel with ultimate street performance. Wheels by Bones are known to have a higher rebound for better speed and higher slide capacity. They also have a resistance to acquiring flat spots that is beyond the typical wheel. The hardness of this wheel is an 83B which is the same as a 103A in other wheel brands out there. As with all B wheels, these are hard and intended for intense skateboarding sessions by experienced riders. All that said, you might think that these would be super expensive, but they aren’t. They’re a very average price considering how quality they are. As far as the diameter goes, these are 54 mm with a width of 34 mm. The wheels are white with a graphic in black and red that shows animal bones. The surface of these wheels are treated, rather than being totally smooth. It may be no surprise that we have a second Everland wheel set on the list. 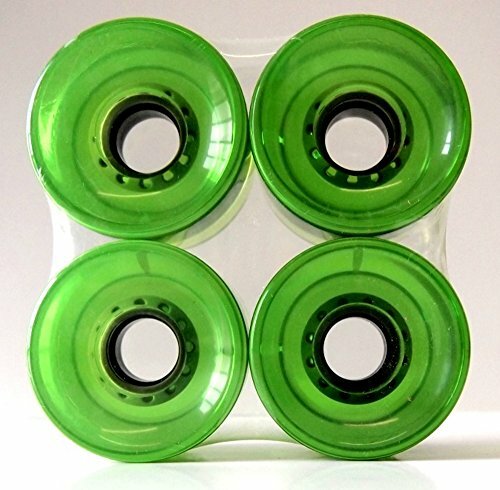 This time we’re looking at 65 x 51 mm wheels that comes in a lime green/clear color. These are a durable option for someone who tends to abuse their skateboard since they aren’t likely to go out on you anytime soon. They also provide an excellent amount of control and balance when riding. If you’re looking for shock absorption, grip, and longevity, this is the set of wheels for you. You can find these wheels in many colors including baby blue, navy blue, purple, orange, red, yellow, and more. All of them have a clear feature that makes them stand out from a darker colored wheel. This is a fantastic wheel set for a cruiser or longboard and will work well on old-style boards. It’s also priced at a serious discount which makes it easy to stock up. 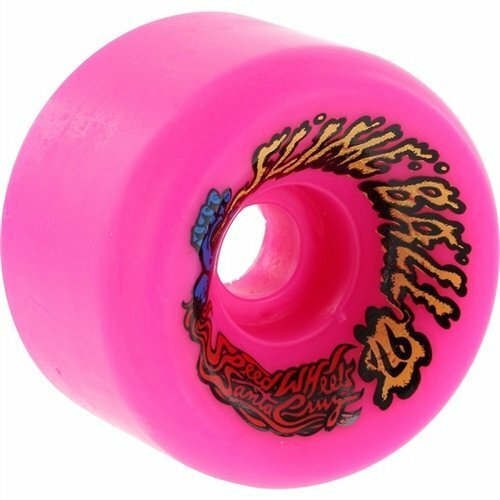 The Santa Cruz Slime Balls Vomit wheels are a remake of the popular wheel from the 1980s. These wheels are a neon pink with graphics in yellow, blue, and red. There are other options of the same design with a green, blue, or white background. If you were a fan of these in the 80s or enjoy something a little different, this might be the right wheel for you. 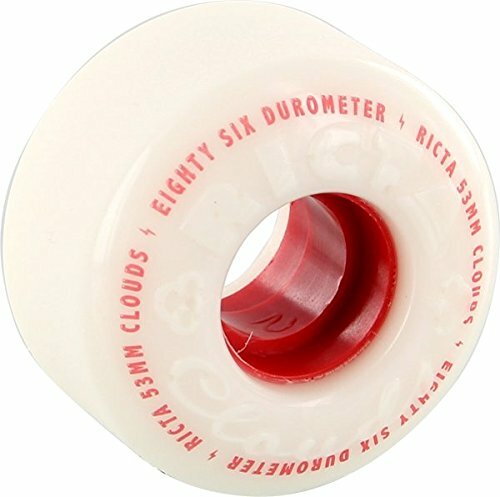 These are wide, smooth wheels with a 60 mm diameter and a durometer or 97A. The riding surface is 28 mm and the width is 42 mm. The durometer makes these great for rough streets, pools, or ditches but can also excel on metal or masonite ramps. These are wheels that are a fairly average price with a dead center bearing with a no flex edge lip design. That means you get a great slide along with fantastic grip. These are some pretty amazing wheels from Atom. You might think you’ve seen it all, but they really bring something new to the table. The wheels have a high rebound with 100 x 65 mm size that will make any longboard complete. 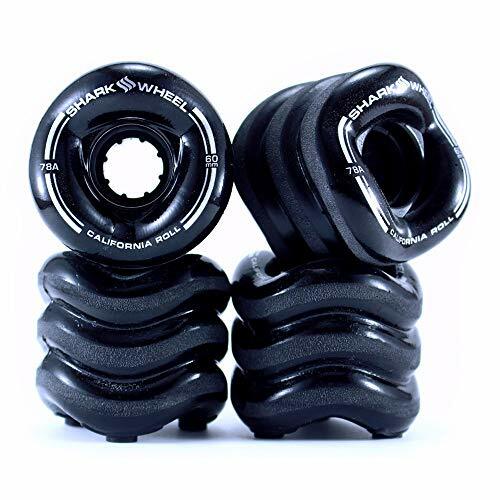 They work well for a beginner who wants to roll over any debris in your way, just as they will offer something new for an experienced longboard skateboarder. These wheels carry a large price tag but that’s to be expected consider the level of innovation that they offer. 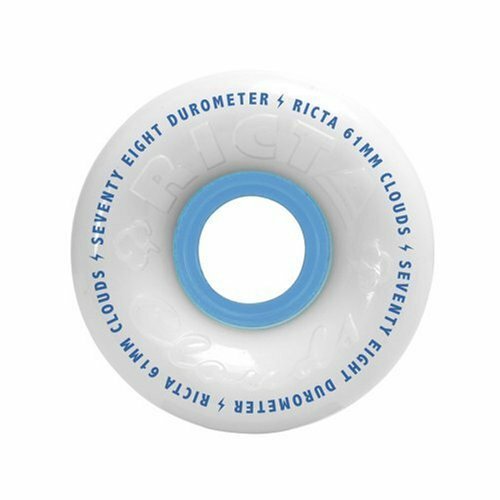 The durometer is 78A to add to the speed and rebound of the urethane wheels. You can ride these on the streets or even sidewalks and pavement that you wouldn’t ride with any other wheels on the market. If you want to go off-road with your longboard, this is the set of wheels that you want in your corner. Except to have a lot of fun with this one. Another skateboard wheel by Powell Peralta is the white Rat Bones, which is similar to the other wheel by the brand that we reviewed. 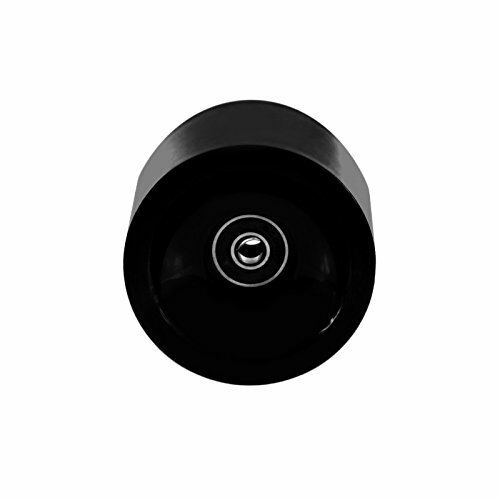 It is a traditional size with a smooth wheel surface and a diameter of 60 mm with a width of 44 mm. The durometer is 90A and works well for either street or park skating. The design is minimalist with a white wheel and text in a light blue color. These are a wide wheel that gives you better stability and traction when going at high speeds and will make you lightening fast in the park. 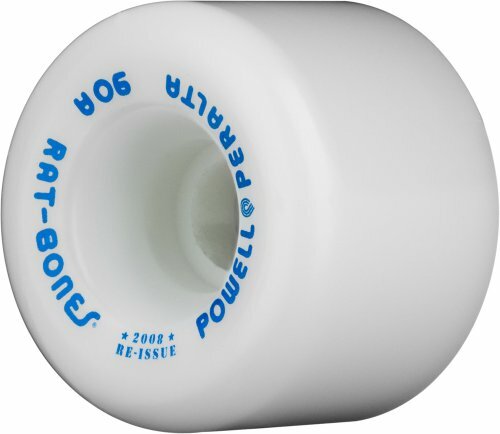 This and all other Powell Peralta wheels are made in Santa Barbara, California and have been built for serious use. The price on them is reasonable and you get a warranty, so you can have peace of mind that they will stay in good condition for a long time. These wheels are durable and soft with a 59 mm diameter and a durometer of 78A. Unlike most other wheels on the market, these come equipped with two Abec9 bearings in each wheel. If you want wheels that really show off your style and taste, these are a fantastic option. They come in blue, green, yellow, pink, orange, and more. For a beginner, these will do the job without requiring a huge investment to get on the street or start skating at the local skate park. These are best used for small boards of 22 inches or similar. Even for a beginner, installing them is simple and requires no more than a T-tool wrench. They may not be top of the line in quality, but they do the job and do it for less and sometimes that is all that really matters. 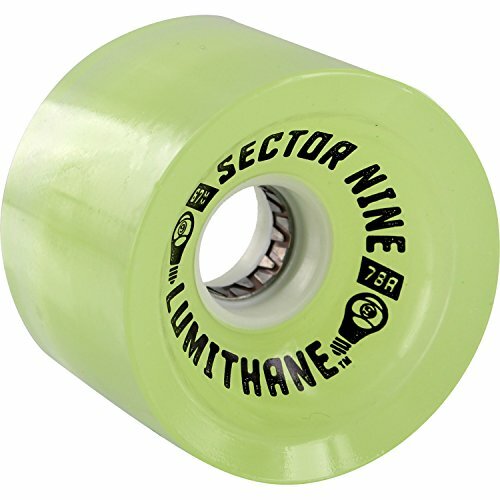 Sure, some of the designs we’ve looked at are pretty eye-catching, but none of them are going to compared to the Sector 9 9 Lumithane LED wheels. They are 67 mm and will fit anything from a longboard to a penny board or a traditional skateboard. You don’t need batteries to make them work, either. The lights occur by the presence of friction so as long as you’re skating, you’re going to be flashing lights. While these are aesthetically appealing, they also increase safety. If you tend to skate after the sun sets, the lights from the wheels will illuminate you and give drivers awareness that you are nearby. These are some of the most inexpensive wheels on the list and the addition of the LEDs makes that surprising. These are great for beginner skaters, as well as young skateboarders who need extra safety to ensure they don’t get injured while skateboarding. The Spitfire Classic Series feature a durometer of 99A and are hand poured and shaped for the best quality possible. If you prefer a classic style, this is a good bet. The wheels are available in a few different colors with an understated design that is sure to appeal. These wheels are 60 mm and work well for old school boards, longboards, dirt boards, and downhill boards. If you care more about speed and flying over debris than doing tricks, this is the type of wheel that will excel. All Spitfire wheels are built to last a long time without sacrificing the qualities that matter. They have a anti-stick slide that gives a controllable grip and a lasting speed no matter where you skate. These wheels are also made to avoid flat spots and are fairly inexpensive for the pleasure of that. They also come with a guarantee against defects in case you happen to get a set of wheels that isn’t up to the quality that you expect. 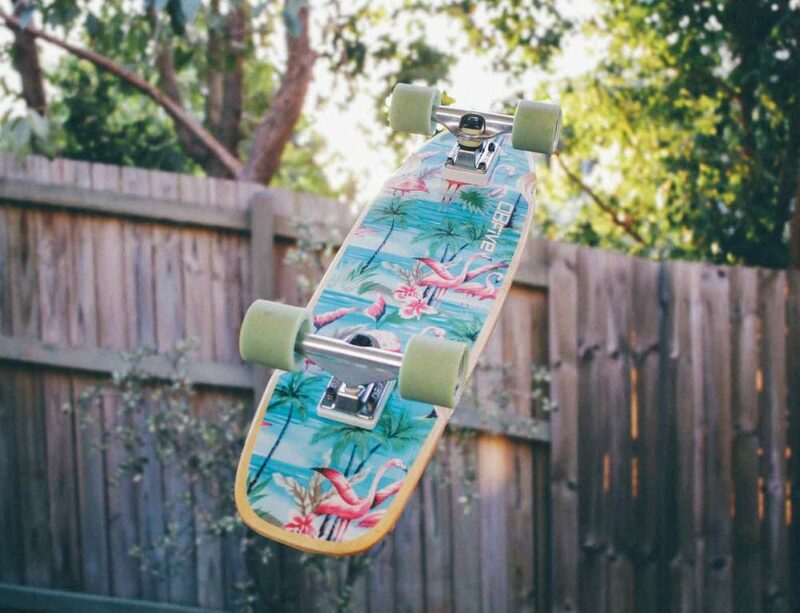 Just like skateboard decks, the wheels that go on skateboards have gone through an amazing evolution as time has gone on. You may be surprised to find out that the original wheels were made of steel. After a while this changed to clay. Both of these options were of a much lower quality then the wheels that go on skateboards today. They are hard to ride on and could be extremely unpredictable. Things started to improve in the 1970s when the first urethane skateboard wheels were introduced to the world. This made a huge impact on skateboarding which is still felt today. Steel and clay wheels did not last long, whereas urethane wheels are durable and long-lasting. In addition, urethane is capable of rebounding and gripping, which has made turning much easier. It also made skateboarders able to roll over debris and rough pavement without feeling every single vibration of the road in your feet. The advent of urethane wheels moved skateboarding from a hobby of a few and into a true lifestyle and culture that millions are a part of. Nowadays, it’s uncommon to find any wheels on the market that aren’t urethane. The good new is that since the 1970s, tons of options have become available with urethane wheels. The two most important things to think about in terms of your skateboard wheels today are the hardness (durometer) and size of the wheel. We talked a little at the beginning of this article about the size of your wheels and how to choose the right option. That is one of the most important things to consider, but there are many others. It’s crucial to pay attention to the durometer of the wheel, the material your set of wheels is made from, shape of the wheel, and more. We’ll also go more in depth with the size of the wheels to give you a more comprehensive idea of which to select for yourself. Let’s jump back in to the wheel size and then go from there. 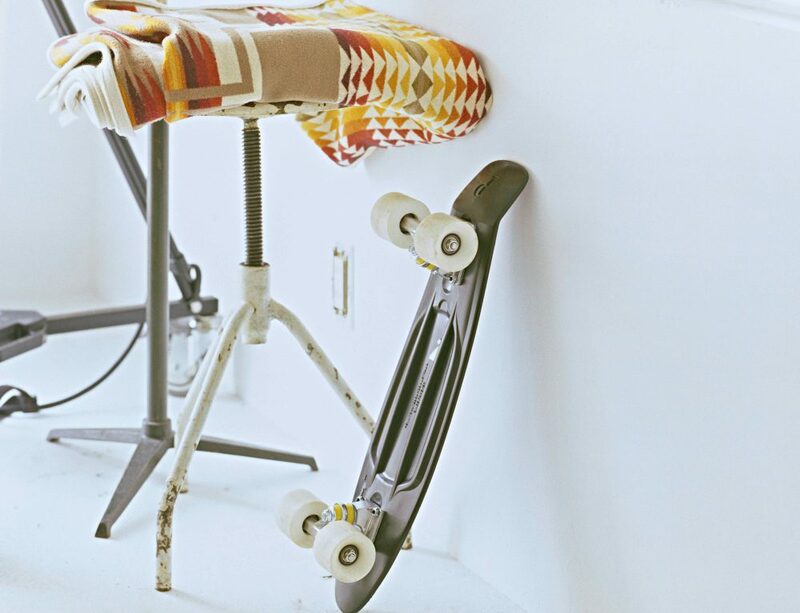 The diameter or size of your wheels controls the performance of your skateboard. Wheels that have a substantial diameter move faster and weight more than small skateboard wheels. Larger wheels also bring your deck off the ground more than a small wheel does. However, small wheels are easier to maneuvers, weigh less, and leave you close to the ground. 70 mm and more – Traditionally used only for downhill longboards. 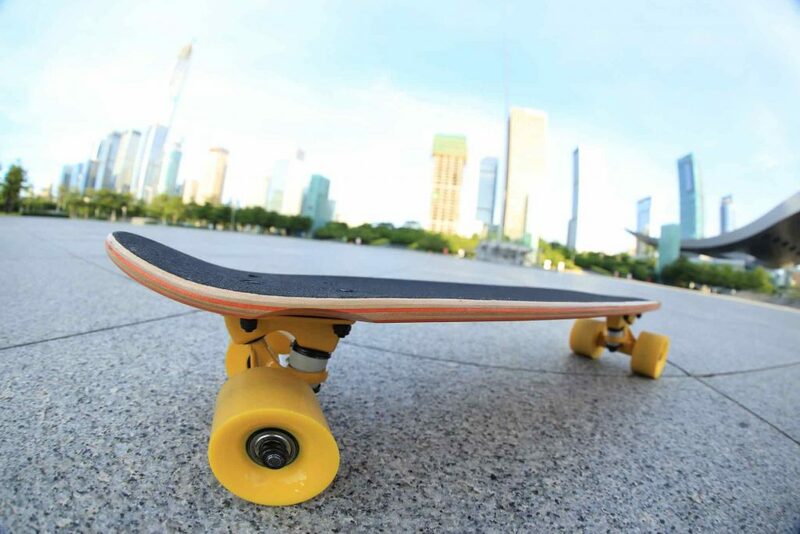 65 to 70 mm – Mainly used for longboards and cruisers but also used by some transition skateboarders. 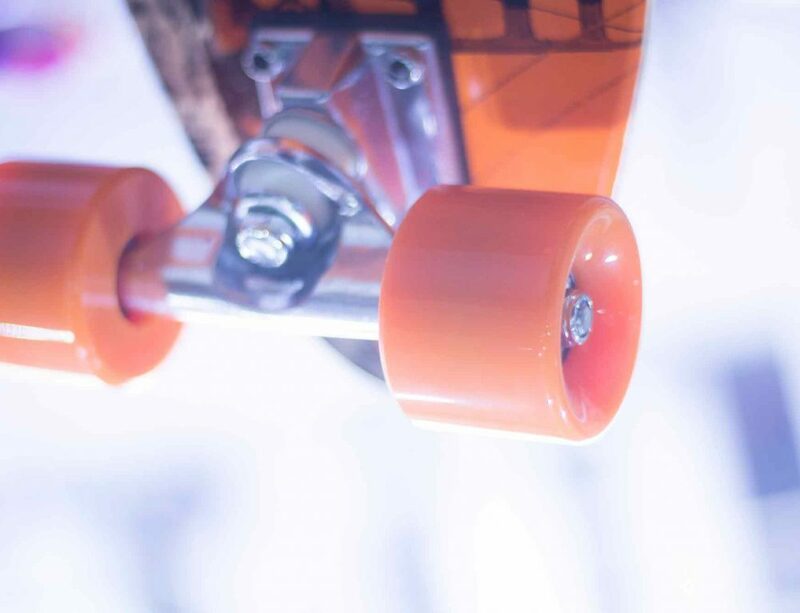 60 to 65 mm – Nearly all wheels of this size are used by transition skaters. 55 to 60 mm – This is the best option for all-around skateboarding when an emphasis is placed slightly on transition. 52 to 55 mm – These wheels are also for all-around skating option but are slightly better for street skating. 49 – 52 mm – This type of wheel is traditional used for technical street skating. As an aside, if you are new to skateboarding, the best option is a wheel somewhere in the 52 to 55 mm size. It gives you the option to try different types of skating but also provides a great base for learning. When we talk about durometer, that refers to the hardness of the wheel. This has a relation to how much shock it is going to absorb for you and how well it is going to grip onto the surface you are skating on. Essentially, when you select a softer wheel, it’s going to compress when it has pressure against it. That means that it is going to absorb a higher amount of shock and have better grip. A harder wheel doesn’t have as much compression potential so there is less grip and less absorption of shock. So, hard wheels are often used by those who care about responsiveness while soft wheels are much smoother. If you choose a hard wheel, that means anytime you roll over something, you will feel it in your feet. This can be a positive because you’ll be aware of what’s happening when you roll over a transition at a skate park or skate through your town full of hills and bumps. These wheels also have the perk of responding quickly and well to any movement you make. As an example, when you snap an ollie, the pressure that you apply to the board is going to transfer to the wheels, which gives you a higher pop. Those who want to cruise around the neighborhood may find soft wheels better. They are able to absorb massive amounts of shock, so you have a smooth ride, no matter where you are. However, these wheels aren’t great for transition or street skating. Rather than sliding or grinding across boxes and other obstacles, the wheels are more likely to stick you to them. The lack of responsiveness also makes it more challenging to do tricks. 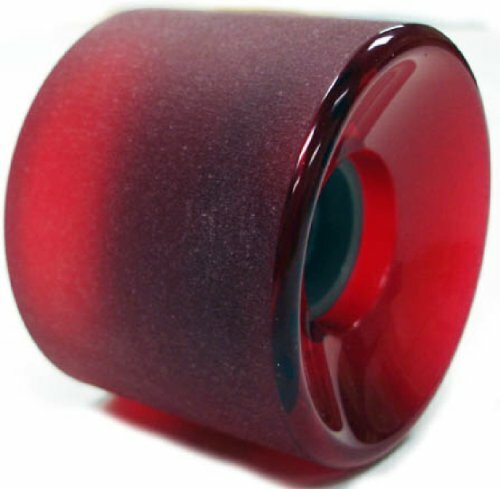 78A to 87A – These wheels will be grippy and soft and ideal for a cruiser or longboard setup. 88A to 95A – These are somewhat harder and faster but will still let you cruise over minor bumps. 96A-101A – These wheels are even faster and harder. This is the common choice for park and street skating. 83B-84B – These are the hardest and fastest wheels of all and are traditionally used for professional park and street skaters. As you can see, most wheel durometers are measured on the A scale, which is the same one that is used when determining the hardness of bushings. This sale is a set of numbers with an A after them. A wheel with a larger number is a higher durometer and a harder wheel. For example, a 78A is going to be quite soft while a 101A is going to be extremely hard. Most skateboard wheels have the durometer listed on it along with the size. Most transition and street wheels are 98A or harder while cruisers are about 78A but can go up to 90A. The B rating scale applies to Bones wheels and measures things in a slightly different way. However, it is only used for harder wheels that are used by expert skateboarders. If you’re new to skateboarding, a wheel of about 101A is going to give you the best results. You can go to 98A for a good experience in the park or street. If you go softer, you will notice that the ride is slower. Those who are more interested in cruising around instead of going tricks can go with a softer wheel. We recommend an option between 78A and 90A. Every skateboard wheel is made for basically the same purpose, but that doesn’t mean that there aren’t many sizes and shapes that you can consider. There are numerous options out there, but we’ll be looking at some of the most common to give you an idea of what you can expect from each. Standard Wheel Shape – When you see a standard wheel shape, that means that there is a limited contact area which has slightly curved beveled edges. Just about every skateboard wheel company out there will have this style and it is the most common to find on a set of wheels. Some companies only use this style since it is the most well-loved and popular. Conical Wheel Shape – A conical wheel has a larger contact area and the sides cone inwards a limited amount. These sets of skateboard wheels are often used by those who skate a lot of ramps, since they can easily lock onto the coping. Radial Wheel Shape – When you think of a conical wheel, the radial is basically the opposite. They have a stronger bevel than a standard wheel with a large contact area. This means there is lots of surface between the road and wheel for a smoother ride, even when choosing a hard durometer wheel. Core Wheel Shape – These wheels are a bit different in that they have a core inside made of a different material that holds bearings. Often the extra material is plastic. The core can sometimes look like the spokes on a bike wheel or it may be a subtler look. In either case, these are generally for a softer durometer but without compromising the stability of the bearing. These can also be a lighter wheel than usual. Cruiser Wheel Shape – Cruiser wheels are the softest durometer of all in order to give an extremely smooth ride. These are not often used for trick riding and instead are place on longboards, vinyl cruisers, and old school boards. Once you put all these things together, you have a good idea of what type of wheel is right for you. Style, size, durometer, and more are all part of what makes a wheel great for longboarding, street tricks, or skate park endeavors. There are hundreds and hundreds of skateboard wheels on the market today and choosing the right one can take a lot of time and research. You have to think about what sort of skating you do and what features are most important to you because of that. You also have to look at the size of the wheels and determine if it fits your riding style. It’s also important to pay attention to the shape of the wheel, durometer of the wheel, and which skateboard deck you are going to add the wheels to. It might seem like a lot, but it’s easier than you’d think and with our list of 15 wheels, you can easily find a selection that meets your needs. So, take a breath, think about what you like to do in terms of skating, and pick out the wheels that call to you. You can’t beat any of these options for quality, value, and durability. Good luck!